A new research report published by Transparency Market Research states that the global dental bone graft substitutes and other biomaterials market is expected to grow due to the continuous rise in periodontal (gum) diseases along with growing incidence of dental fractures. The report, titled “Dental Bone Graft Substitutes and other Biomaterials Market - Global Industry Analysis, Size, Share, Growth, Trends and Forecast 2014 - 2020”, is available for sale on the company’s website. Expert industry analysts have examined the market with the help of a Porter’s five forces analysis and SWOT analysis to highlight the key trends and dynamics influencing the market. 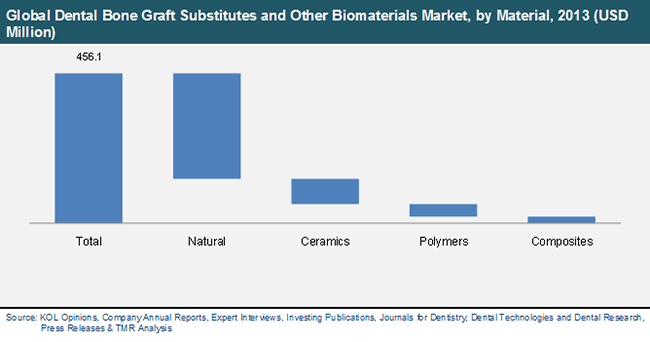 The natural materials segment held a mammoth share in the global dental bone graft substitutes and other biomaterials market in 2013. This segment is further divided into xenografts and allografts. The global market for dental bone graft substitutes and other biomaterials has been estimated to expand at a CAGR of 10.6% from 2014 to 2020.From 2014 to 2020, the xenografts segment is estimated to grow at the highest CAGR of 11.10%. This remarkable growth will be due to the growing preference of tissue banks to collect bone tissues sourced from bovine animals instead of humans. Furthermore, the growing acceptance of grafts from animals is also bolstering the xenografts segment. On the other hand, the allografts segment will also grow at an accelerated rate due to increasing acceptance amongst patients and tissue compatibility post-transplantation. Additionally, manufacturers are working towards developing allografts that will contribute to winning a larger market share.Regionally, North America and Europe together held over 70% of the revenue in the global dental bone graft substitutes and other biomaterials market. This sizeable share can be attributed to the presence of important players such as DENSTPLY International and Institut Straumann AG. However, analysts predict Asia Pacific will grow at the highest CAGR in the next five years due to the huge geriatric pool and rising dental tourism. Out of all the segments, the ceramics segment will grow at a rapid pace in the near future. The global dental bone graft substitutes and other biomaterials market report profiles some of the key players such as Medtronic, Inc., ACE Surgical Supply Company, Inc., Biomet, Inc., BioHorizons IPH, Inc., Geistlich Pharma AG, Zimmer Holdings, Inc., DENTSPLY International Inc., DePuy Synthes, and Institut Straumann AG. The report offers an insight into their company profiles, investment outlooks, business and marketing strategies, financial overview, list of existing products and those in the pipeline, and research and development activities. The report gives a comprehensive overview of the competitive landscape of the global dental bone graft substitutes and other biomaterials market with the help of a SWOT analysis and Porter’s five forces analysis.